Size (inches): 2.17" X 6.10" X 9.06"
Dandelion root is usually used to help support the bile-secreting liver organ. Dandelion root also disinfects the blood, raises bile production and gives a boost to the role of the spleen, pancreas, abdomen and kidneys. It can be used to help support painful inflammation of the joints, anaemia, joint pain, liver health, furuncles, cramps, fluid retention and irregularity. It incorporates biotin, choline, fats, inositol, linolenic acid, pantothenic acid, lactupicrine, inulin, magnesium, niacin, PABA, iron, manganese, phosphorus, potash, sulphur, protein, calcium, chromium, vitamin A, B1, B2, B6, B12, C, E and zinc. References. Balch, 1997; BHMA Medical Committee, 1996; Hallowell, 1994; Hoffman, 1994; Tyler, 1993; Tyler, 1994; Wishard, 1995. Fresh drawn, boiling water contains the most oxygen, thereby giving the fullest taste to tea. Water that has been boiling for some time looses the oxygen and thereby the best taste. Allow full expansion during the infusion and easy removal after the time for steeping has elapsed. Draw into a tea pot or kettle the best fresh water that you have available. Warm the teapot and cups while the water is boiling. Discomfort due to gastric hyperacidity may occur. In case of gallstones or obstruction of the bile ducts, gallbladder, or bile ducts seek professional medical advice before consumption. 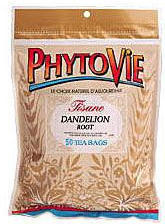 PhytoVie manufactures a wide selection of therapeutic and aromatic teas. 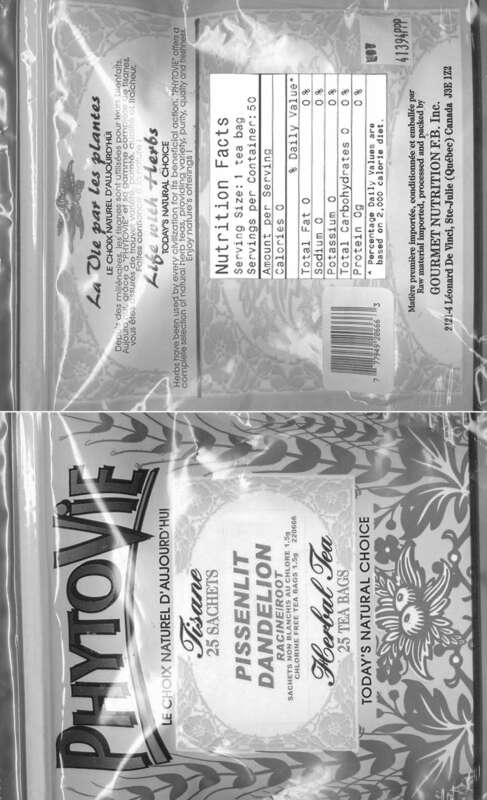 The PhytoVie manufacturing process guarantees the quality and consistency of each and every tea bag. Our buyers select only the highest premium quality teas each season, importing from around the world. Each tea bag contains only the finest quality ingredients.